Prince Bernhard of the Netherlands! Prince Bernhard, was the father of the current Queen of the Netherlands, Queen Beatrix. In the 1930s, with the rise of Adolf Hitler, Prince Bernhard's younger brother Aschwin, publicly declared his support for the Nazi Party. Prince Bernhard himself trained as a fighter pilot and then was later made an officer of the German Reiter SS Corps. While investigating the prince’s past Ms van der Zijl, a researcher, stumbled upon a membership card for the Deutsche Studentenschaft, a National Socialist student fraternity, in the archives of Berlin's Humboldt Universität. The prince attended this university in the early 1930s. According to the membership card, Bernhard - then totally unconnected with the Dutch royal house - became a member of the Deutsche Studentenschaft in 1932. The card also shows that he decided to join several other National Socialist organizations in 1934. Among these organizations was the Sturmabteilung, the paramilitary arm of the Nazi party, and the political Nazi party itself (the NSDAP). The card shows that he terminated his membership of all these organizations when he left the university in December 1934. All the information on the document is written in Bernhard’s own hand. The Prince eventually went to work for the Nazi German chemical company, IG Farben which was manufacturing the chemicals for the gas chambers. He married Juliana in 1937. Prince Bernhard became a member of the councils of all branches of the Netherlands military and was Chairman of the Joint Chiefs of Staff. He was made a director of Fokker Aircraft, KLM Royal Dutch Airlines, and within a few years was invited to serve on the board of directors of numerous international corporations. 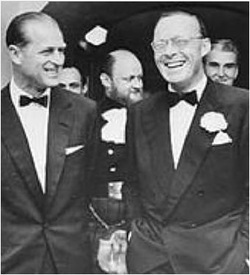 After a 1952 trip with Queen Juliana to the United States, Prince Bernhard was heralded by the media as a business ambassador extraordinaire for the Netherlands. With his global contacts, in May of 1954 he was key in organizing a meeting at the Bilderberg Hotel in the Netherlands for the male-only business elite and intellectuals of the Western World to discuss the economic problems in the face of the then growing threat from communism. As a result of the success of this first meeting, it would become an annual affair known as the Bilderberg Group. The idea for the European Union was spawned at Bilderberg. The family tradition has continued with Queen Beatrix overseeing the meetings!